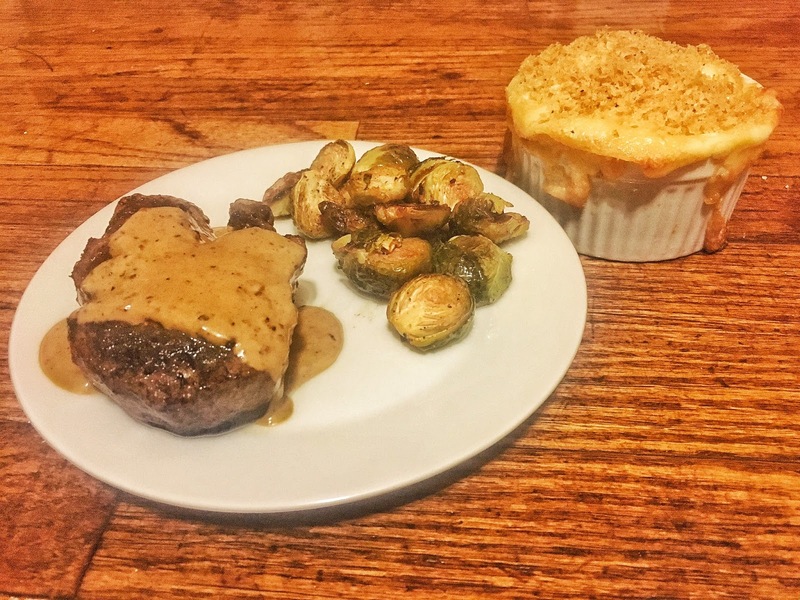 This is my take on a classic steak au Poivre which is steak with a creamy peppercorn sauce. Traditionally you would use a mortar and pestle to crush whole peppercorns but I don’t know about you, I lack both counter and storage space for one so I use my trusty McCormick pepper grinder set to the largest setting. Now I’m sure you’re thinking “that’s expensive at a steak house” and it is, but you’ll be shocked to know that for two this meal is less than 25 dollars! I like to make this with filet mignon because it is very tender, but a New York Strip works as well. I got my two filets at my local Fairway Market for 11.99 a pound, two six ounce steaks came to just about 9 dollars. While I am not a Costco shopper, a tip for you is that sometimes buying in bulk is a great option to keep your cost down. When Filet Mignon is on sale for a whole filet at 7.99 a pound I like to buy a small one, have them clean it and cut it into 6 oz steaks and freeze them, then you can have a fancy dinner any time you want for less than you would spend at Applebees. Salt and pepper both sides of your steaks heavily, a lot of this seasoning comes off when you cook them and due to the low fat content in filet there is less flavor to work with. Grind two tablespoons of pepper on the largest setting and set them aside. Add butter and olive oil to a skillet, I use nonstick but you can use cast iron as well, when the butter begins to smoke place the steaks in the pan and use a timer, 4 minutes will give you a nice medium on steaks that are about 1.5 inches thick, if you are not sure a meat thermometer is still your best bet to insure proper cooking. Flip the steaks and cook for 4 more minutes, remove from the pan and set aside. This is where you will want to be VERY careful, as there WILL be fire, and you do like your eyebrows. Turn off the burner under your pan and add your bourbon, quickly use a long match or long lighter to ignite the bourbon, once the flame dies out turn the burner back on and add the cream and cracked pepper to the sauce. Season the sauce with salt to taste. Let simmer for about five minutes or until the sauce thickens. Some recipes call for you to add the steaks back to the pan but I prefer to spoon the sauce over perfectly cooked steaks. 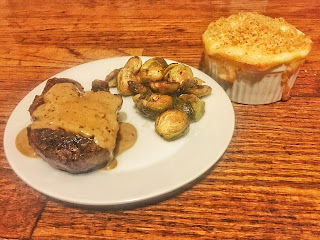 I served this with roasted Brussel sprouts and cauliflower gratin much like you would get it at a steak house, a more fresh side and a more rich creamy side but you can also serve this with a salad and some crispy shoe string French fries!